I decided to learn how to fry chicken and make homemade gravy while I was still in high school. I was dating Ted, who later turned out to be my ex-husband. His mom, Geraldine, made some of the best fried chicken I’ve ever had, to this day. She used an electric fryer and as much as I tried to duplicate her recipe, I couldn’t get it exactly right. My Dad made really good fried chicken as well, and he used cast-iron skillets instead of electric fryers. I couldn’t replicate his recipe either, so I decided to take some of the techniques from both of them and come up with my own signature dish. And that I did. By the time I was in college, I had a recipe that I was quite pleased with. I bought a cast-iron skillet that I used just for frying chicken and still have to this day (I have my Dad’s skillets, too!) Unlike my Dad and Geraldine, I decided to marinate my chicken in buttermilk at least 6-8 hours before frying. Buttermilk is a natural tenderizer and helps to make the chicken nice and juicy. I also added crushed cornflakes to my flour mixture, which gives the chicken extra crunch. This was one of my most requested dishes for several years, until the age monster made so many of us watch our fried food intake. 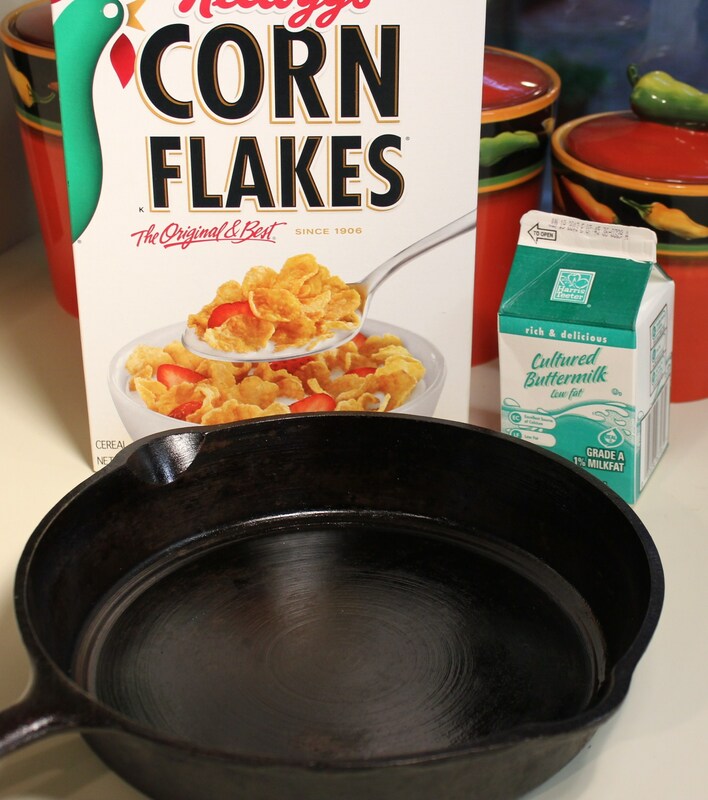 But every now and then, I love to get out my cast-iron skillets and fry up a batch of this wonderful comfort food. 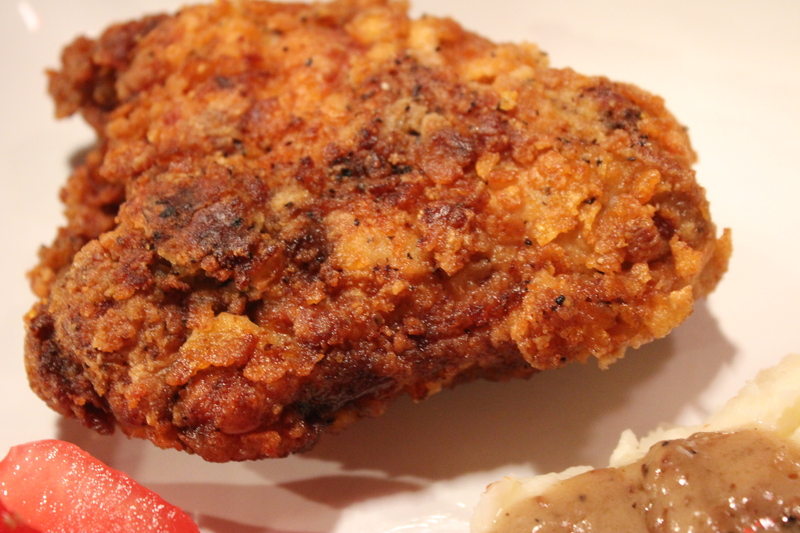 National Fried Chicken Day is July 6th — a great reason to give this a try, or make some for your Fourth of July celebration. You’ll be glad you did! This entry was posted in Meat and Poultry, Recipes and tagged buttermilk fried chicken, eat drink and be merry, fried chicken cast iron skillet, fried chicken cornflake coating, fried chicken recipes, Ke's crunchy fried chicken, kel's cafe of all things food, Kelley Chisholm recipes on July 2, 2013 by kelscafe. I love black beans, especially in salads. I’ve been making this particular black bean salad for years and it’s one of my go-to dishes to take to pot luck lunches or dinners. 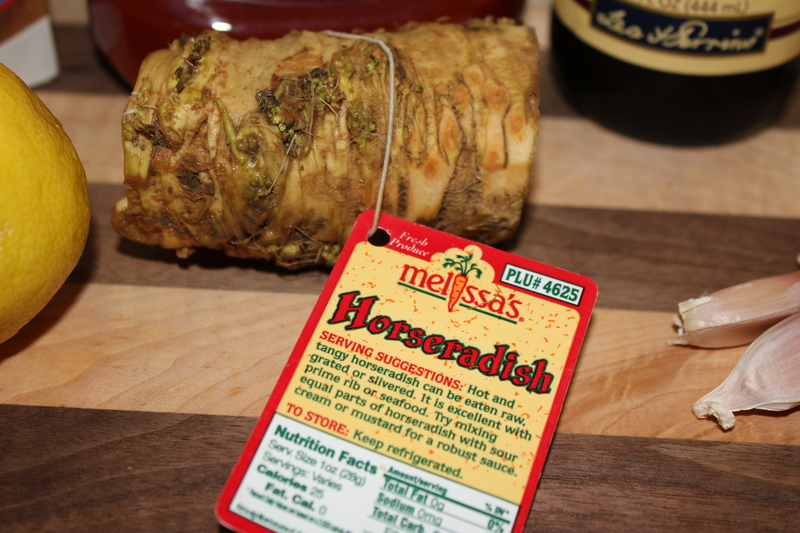 It goes great with Mexican dishes, as a side to chicken and fish, or as a stand-alone salad. 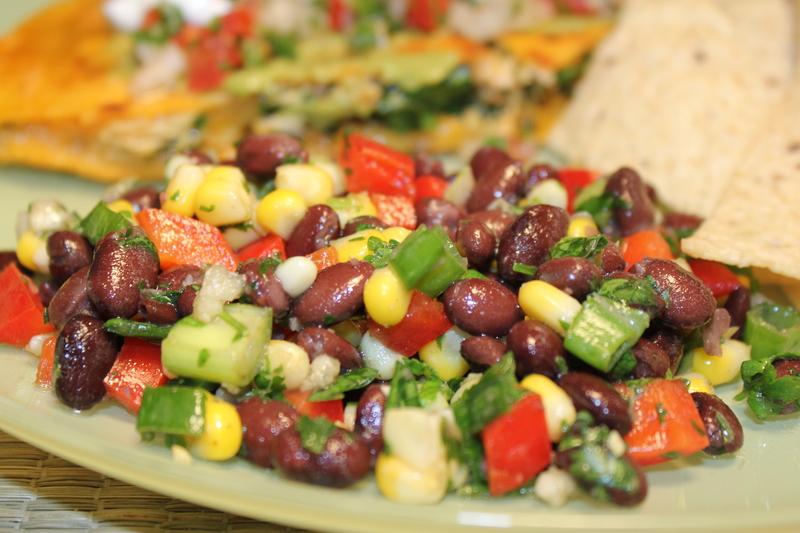 Not only is this black bean salad fast and easy to make, it is good for you and, as an added bonus, vegan. The red bell peppers and corn give it a slight bit of sweetness and a lot of crunch, and the jalapeño hot sauce and lime juice make the perfect marinade for it. 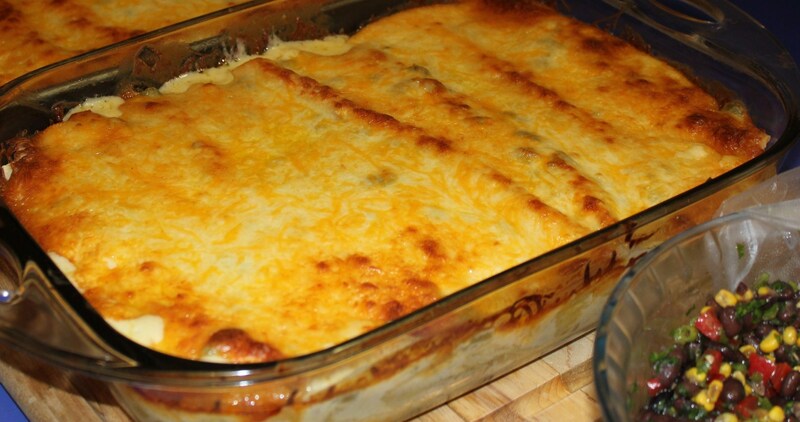 It is one of my most requested recipes! This entry was posted in Recipes, Vegetarian/Vegan and tagged black bean corn red pepper salad, eat drink and be merry, Kel's Cafe basic black bean salad recipe, kel's cafe of all things food, Kelley Chisholm recipes, Vegan black bean salad recipe on June 18, 2013 by kelscafe. 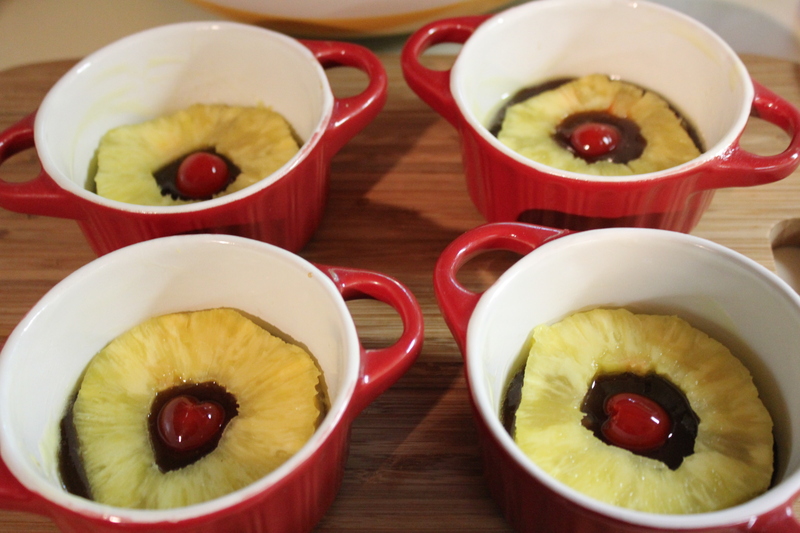 Break out your ramekins – it’s time to make individual pineapple upside down cakes. These mini-cakes are so cute and the brown sugar and Grand Marnier sauce is awesome. It soaks into the cake, making it incredibly moist, not to mention mouthwatering delicious. I use fresh pineapple for this, but you can use the canned rings instead (buy the pineapple in its own juice, not heavy syrup.) Also, I use a boxed cake mix, but feel free to use your favorite homemade cake batter. I did have enough batter from the cake mix to make six cupcakes, which made the kids happy! 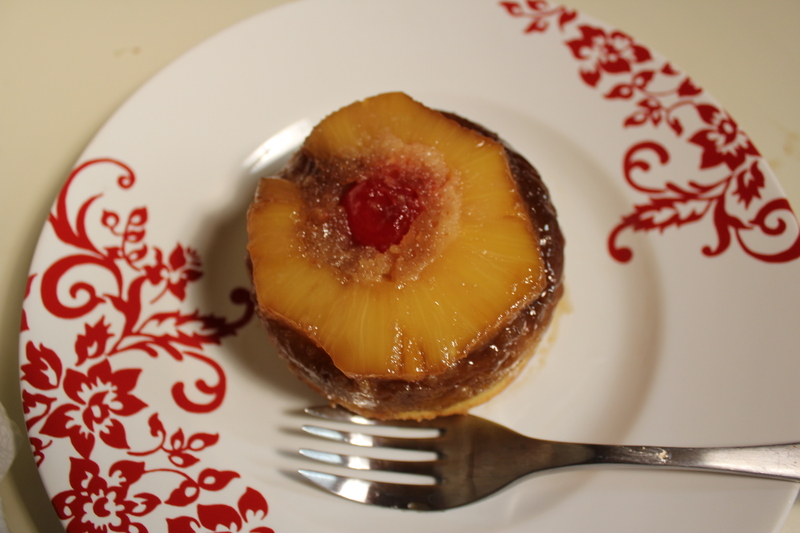 Or, just make more of these fantastic pineapple upside down cakes. This entry was posted in Desserts, Recipes and tagged eat drink and be merry, individual pineapple upside down cakes, kel's cafe of all things food, Kelley Chisholm recipes, mini pineapple upside down cakes, pineapple upside down cake Grand Marnier brown sugar sauce, pineapple upside down cake recipe on June 14, 2013 by kelscafe. My friend and fellow foodie, Jerry Jackson, sent me this recipe for marinated yellow squash the other day. Jerry is (among other roles) senior editor and publisher of FMI Quarterly, the journal I edit, and he loves to go to all of the new restaurants in the area and then let me know which ones are worth visiting. We meet several times a year to discuss Quarterly production, etc., usually at an area restaurant, which is much better than getting together in the office. 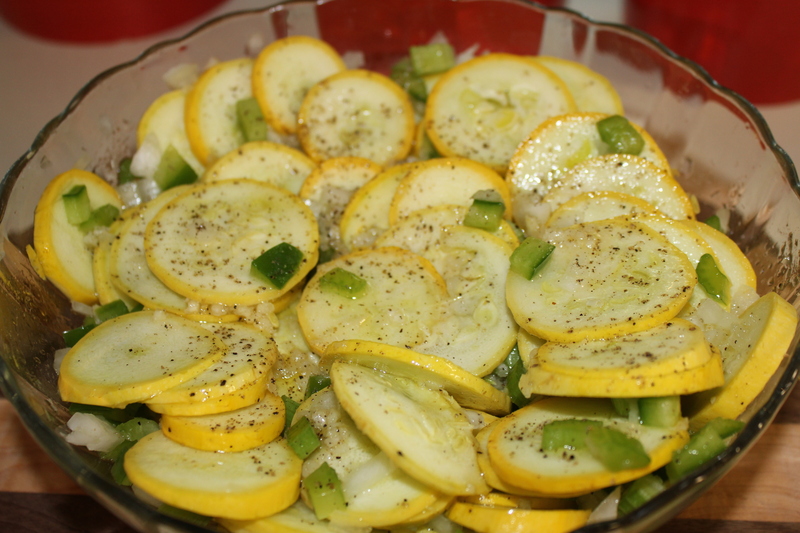 This entry was posted in Recipes, Vegetarian/Vegan and tagged eat drink and be merry, Jerry Jackson's Marinated Yellow squash recipe, kel's cafe of all things food, Kelley Chisholm recipes, marinated summer squash, no-cook marinated yellow squash, vegan recipes, vegetarian recipes, yellow squash recipes on June 11, 2013 by kelscafe. For nearly 30 years, a group of us who used to work or hang out at The Pub in Raleigh (now closed) has been going to the beach for a week around Memorial Day. While many of the faces have changed during the years, one thing has remained constant and that is the wonderful food that is prepared during the week. 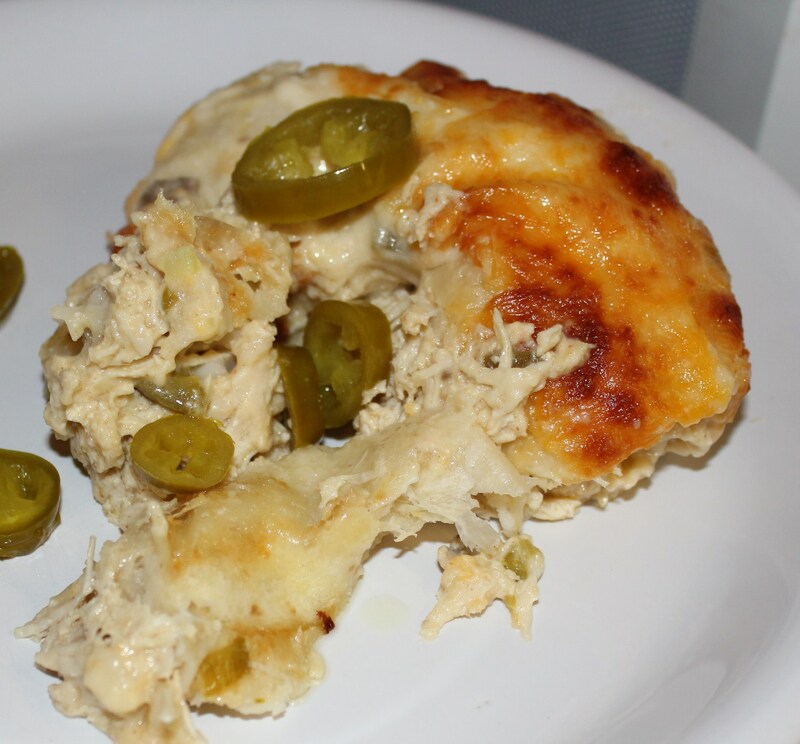 This entry was posted in Meat and Poultry, Recipes and tagged chicken and cheese enchiladas recipe, chicken enchilada recipe, eat drink and be merry, Joyce's cheesy chicken enchiladas, kel's cafe of all things food, Kelley Chisholm guest blogger, Kelley Chisholm recipes on June 4, 2013 by kelscafe. Fresh pineapples and avocados were on sale in several different grocery stores the other day – I think they were marking down these items after Cinco de Mayo. Whatever the reason, I was thrilled and decided to make a new salsa with said pineapple, avocado and tomatoes as the base. 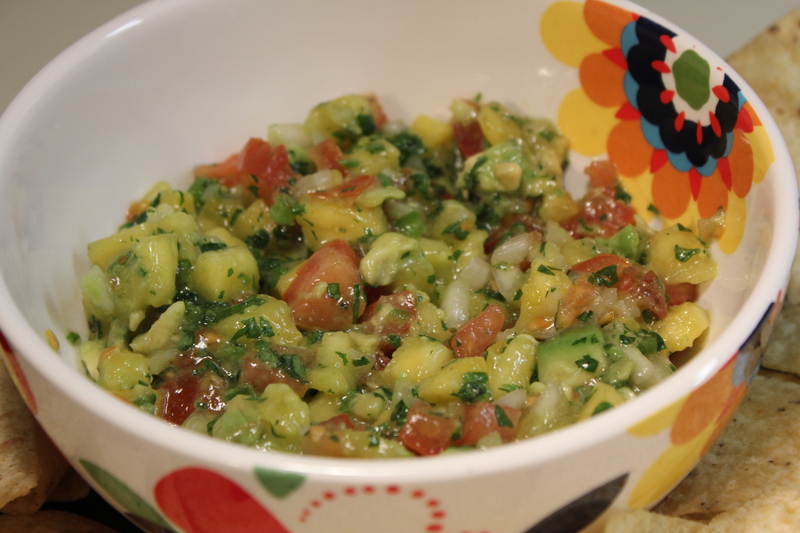 This stuff rocks – what a great and refreshing salsa that goes great with pork (and I imagine salmon or other fish), or by itself as a delicious and refreshing dip with tortilla chips. I knew I had a hit on my hands the first time I made this salsa and left it on a counter at work — once my coworkers discovered it they told others they had to try it! I made it a week later when we were at the beach with a bunch of friends, again to many positive reviews. Don’t hesitate to take this to a pool party or picnic this summer — it won’t last long! This entry was posted in Appetizers, Recipes, Vegetarian/Vegan and tagged eat drink and be merry, kel's cafe of all things food, Kelley Chisholm recipes, pineapple avocado guacamole recipe, pineapple tomato avocado dip recipe, Pineapple tomato avocado salsa recipe, vegan pineapple tomato avocado recipe, vegetarian recipes on May 26, 2013 by kelscafe. 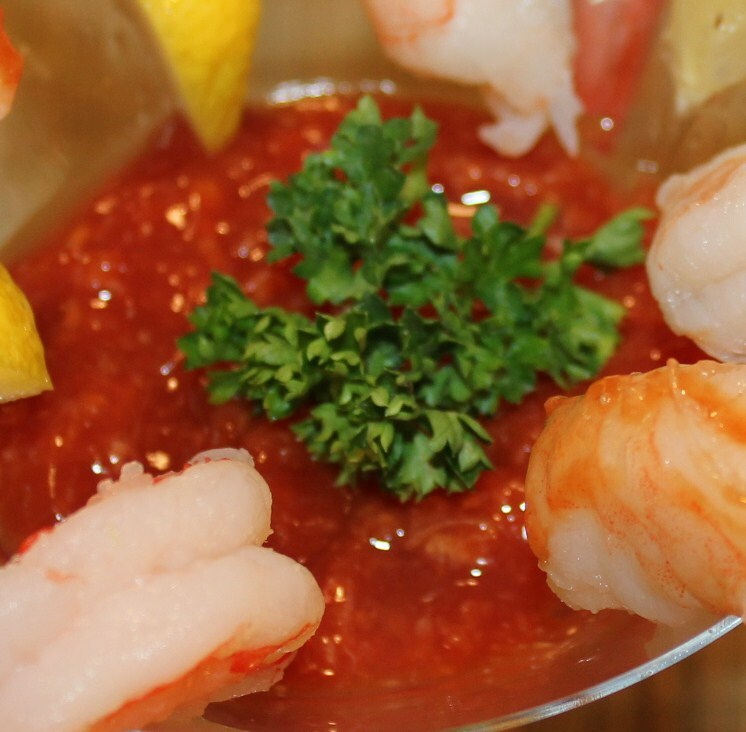 I found some large, cooked shrimp on sale at the grocery store the other day and decided to make some shrimp cocktails as appetizers. I have the bad habit of buying prepared cocktail sauce in a bottle and only using half of it, so the rest usually is out of date by the time I’m ready to use it again. To keep from wasting any cocktail sauce, I decided to make my own, since all of the ingredients needed are staples in my kitchen, except for fresh horseradish. The great thing about this sauce, in addition to it being so fresh, is that you control the spiciness and tanginess with the amount of horseradish and lemon juice you use. Plus, you make only what you need. It’s so simple, but oh so good! This entry was posted in Appetizers, Pescatarian, Recipes and tagged cocktail sauce fresh horseradish lemon, cocktail sauce recipe, eat drink and be merry, kel's cafe of all things food, Kel's tangy cocktail sauce, Kelley Chisholm recipes, shrimp cocktail with fresh cocktail sauce on May 17, 2013 by kelscafe. Tomato season will be upon us soon and I can’t wait — a freshly picked homegrown tomato is one of my top-five favorite foods, and maybe in my top three. I still like tomatoes when I can’t get them straight out of the garden, but am more likely to cook them since the quality isn’t quite the same. The other day I found some decent-looking tomatoes on sale and decided to stuff them with cheese and breadcrumbs. Spinach also was on sale, so I figured I would add that to the mix as well as Parmesan/Reggiano cheese and some Gruyere that I already had at home. My last decision was between Italian breadcrumbs or panko. Time to experiment! 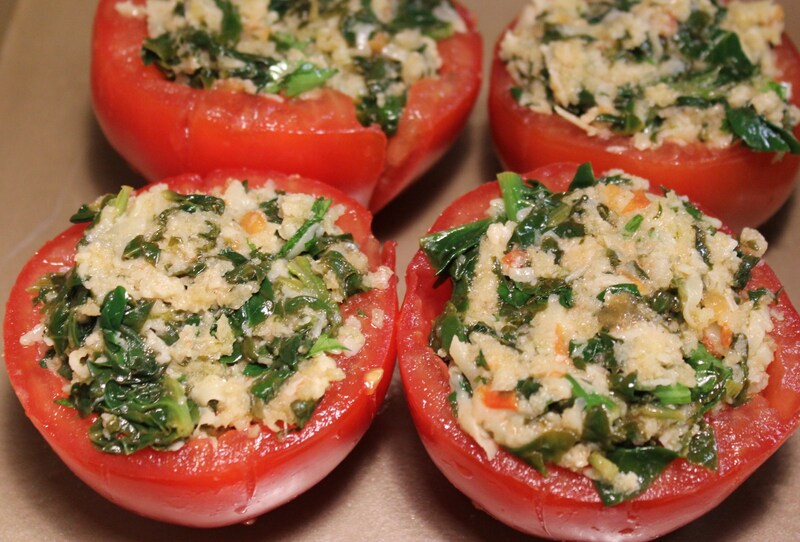 This entry was posted in Recipes, Vegetarian/Vegan and tagged Baked spinach cheese tomatoes, eat drink and be merry, kel's cafe of all things food, Kelley Chisholm recipes, stuffed tomato recipe, stuffed tomatoes with spinach cheese panko, vegetarian recipes on May 14, 2013 by kelscafe. Here’s a refreshing pasta dish that I have been making for years. It stars fresh angel hair, lemon and garlic, and is quick and simple to make. 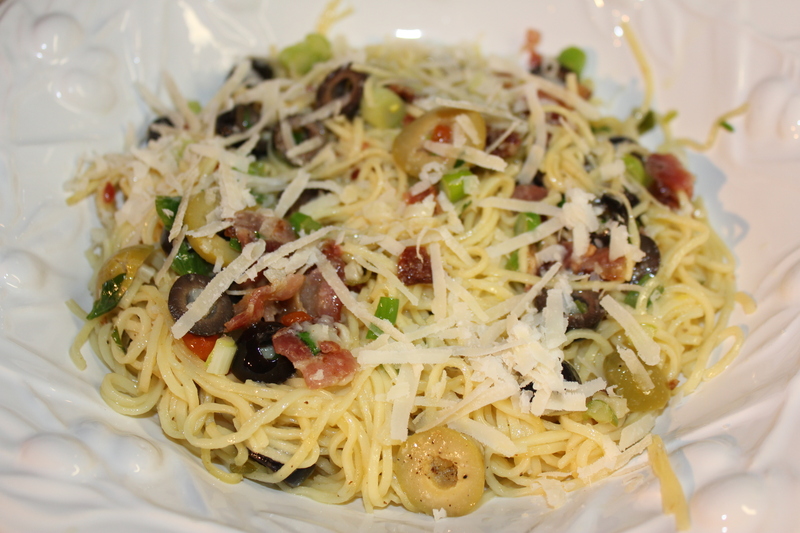 The addition of bacon, black and Spanish olives, butter and Parmesan/Reggiano cheese makes it melt-in-your-mouth heavenly. Leave out the bacon for a vegetarian version that also is sure to please! If you don’t have fresh pasta, the boxed angel hair is good too, it just doesn’t absorb the sauce quite as well. This entry was posted in Pasta, Rice, etc., Recipes and tagged Angel hair pasta recipe, angel hair with bacon olives lemon butter, angel hair with lemon garlic wine butter sauce, eat drink and be merry, kel's cafe of all things food, kel's cafe recipes, Kelley Chisholm recipes, Lemony-garlic angel hair pasta on May 9, 2013 by kelleychisholm. 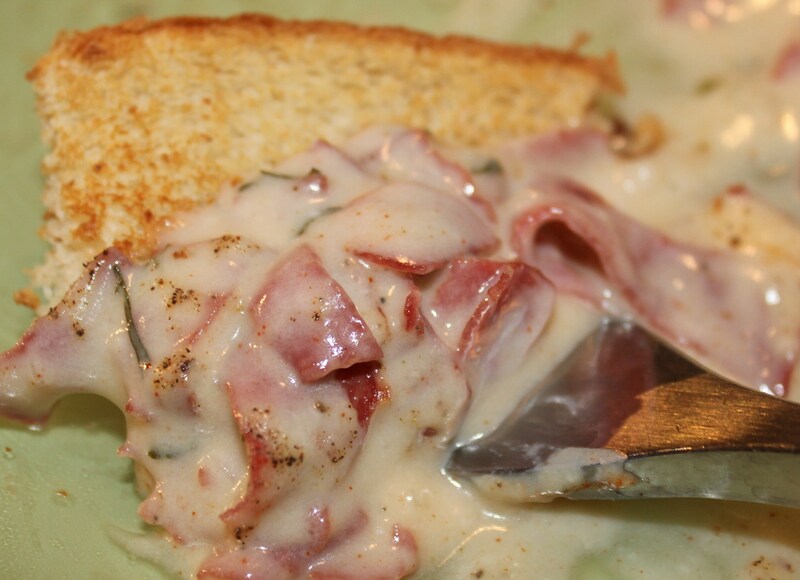 When’s the last time you had creamed chipped beef (affectionately referred to as SOS in the military)? It had been a while for me, which is a shame because I love this creamy and delicious comfort food and have been making my own since my college days. I have a husband that doesn’t care much for food with sauces or gravies (unbelievable, I know), so lately the only time I get to enjoy creamed chipped beef is in a restaurant, usually for breakfast/brunch. The other night I came home from water aerobics and Brad and the kids had already eaten. It had been dreary all week and much cooler than normal for a North Carolina spring. I knew I wanted something warm and satisfying that wouldn’t take long to make and was thrilled to run across a jar of dried beef. Perfect – SOS to the rescue. 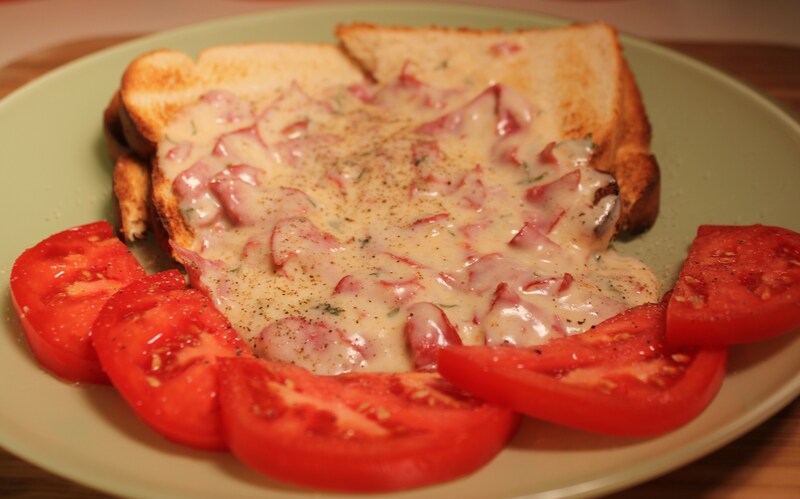 This entry was posted in Meat and Poultry, Recipes and tagged Comfort food creamed chipped beef, creamed chipped beef on toast, eat drink and be merry, kel's cafe of all things food, Kel's creamed chipped beef recipe, Kelley Chisholm recipes, SOS recipe on May 2, 2013 by kelleychisholm.